How to know if you are a flamer and how to fix it! No Man’s Sky: Is too much choice a good thing? Students in UK and France: A struggling way of life? There have been many, many rumours about our girl Selena and if you’re as sick of them as I am then, well, you’ll want to know the truth and slam the lies just as much as I do. Of course, we all know about ”Jelena” (Justin Bieber and Selena Gomez, who have had an on-off relationship for years that recently ended) but since then there have been many celebrities who Selena has apparently had a brief relationship with, here are six celebrities that Selena has allegedly dated – but the rumours have been slammed. As cute as Selena and Charlie look together, the rumours weren’t true. Charlie and Selena brought out the song ”We Don’t Talk Anymore” earlier this year, which was extremely deep into their personal love lives and meant a lot to both of them. Working on this album brought the two closer together – no, not that close, but they became very good friends and Charlie knew that Selena could relate to this song a lot more than he could because of her relationship with Justin which ended leaving Selena heartbroken. I apologise to anyone who shipped the two together but, no, it never happened and as confirmed by the two of them it never will. They are just friends. The rumours came out of nowhere when the pair were spending a lot of time together, but not longer after they confirmed that they were never dating, they were always just friends. ”We’re friends, I’m very happy to have collaborated with her. She’s a really awesome singer.” Charlie Puth said in an interview when on the topic of Selena Gomez. Apparently making a song together means that they are dating, according to rumours. Thanks to Charlie and Selena who are both very open about their relationships, they both cleared up the rumours quickly by confirming that they are just friends who are touring together. 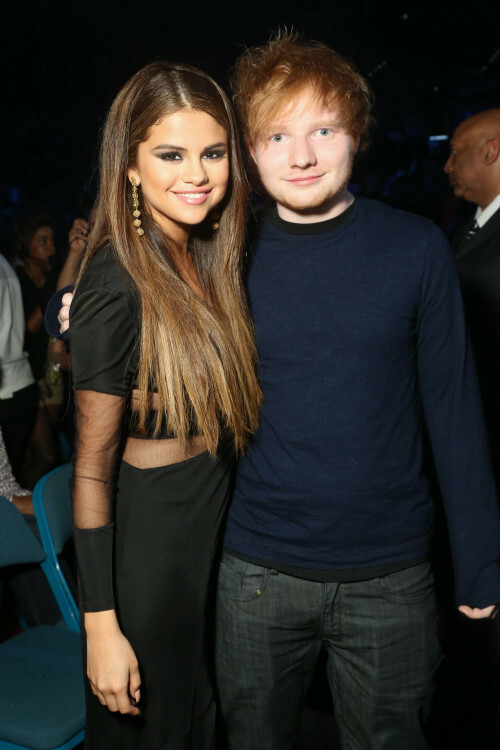 Ed Sheeran and Selena Gomez were allegedly hooking up in 2013, because Ed and Selena were seen having lunch together, this quickly spiralled into rumours of that being a date. As cute as the two singers look together, both have denied any sort of relationship and confirmed they are just friends. Although, there are also rumours that they are making music together! Even though the dating rumours are false, surely we can at least have some music from the two, as talented as they are! These rumours have not been confirmed nor denied, so we just have to wait until one of them clears everything up. Unfortunately for Edlena shippers, the dating rumours are untrue and despite all the time they are spending together, it is nothing more than a beautiful friendship. Also close with Ed, however, is Selena’s bestie Taylor Swift, who Ed goes to for musical advice, so it comes as no surprise that both Taylor’s friends become friends. But the point of the story is that they are just friends. The dating rumours came out of nowhere when the two were spotted together several times, but neither of them seemed offended or angry when the rumours spiralled, instead they both just denied the claims. They are both super talented, though – imagine what music the two of these could come up with! Yes, everyone Selena is friends with is her alleged partner, including women. When Selena was caught showering with model and actress Cara Delevingne, the media went crazy with articles about their relationship. Selena said she loved the rumours that they were dating, mainly because the focus was off her relationship with Justin Bieber and onto someone else in her life. When Cara and Selena were spotted together many times and Selena opened up about her sexuality, this left people wondering if the two are together. But, no, the rumours were soon cleared up and even though Selena loved the rumours she still had to deny any relationship with very good friend Cara. These rumours didn’t last very long as Selena is very open about her love life and will deny or confirm any rumours that are spreading about her. Cara soon confirmed her relationship with St. Vincent which also shut down the Cara/Selena rumours. Cara is very much in love with her long-term girlfriend and soon stopped everybody from believing the rumours that Selena and Cara ever dated. Sorry folks, but Selevingne (or whatever their ship name is) is not going to happen anytime soon. The rumours were spread after the two spent lots of time together, but since Cara made an appearance in Taylor Swift’s ”Bad Blood” video alongside Selena, it’s obvious that the two were bonding, but they are nothing but friends – and very good friends, at that! Nothing was ever confirmed nor denied about Selena and Austin’s relationship, although many people believe that they dated briefly back in 2014. The two were seen together quite a bit, getting cozy and looking rather friendly. Reportedly, Selena’s bestie Taylor Swift was the one who set them up! It was only celebrity gossip websites that confirmed that they were ”official”, but because of the age difference, the media had concerns about the two singers’ relationship and how it would work. Anyway, the rumours were soon cleared up as Austin revealed that they are just friends. It’s unclear where the rumours came from that the pair had dated a few years ago, but they had been seen together a few times and he said in an interview that he ”hit her up” to see what she was doing and that they should hang out whilst they’re both in the same area, and they did in fact hang out quite a bit, but they soon stopped being seen together. Of course, since then Austin has dated quite a few girls, but Selena was never one of them, I’m afraid. Are you ready for this one? Because this story is one of the most hilarious Selena rumours… So, whilst on the ”rebound” from the Biebs, many people claimed that Selena was in love with Justin and, get this, carrying Zedd’s baby – at the same time! Obviously this is untrue as it’s been years since this accusation and, well, there’s no sign of a baby! Zedd and Selena are very good friends, which is obvious because they worked together and got close whilst recording ”I Want You To Know”. But after coming on this false Selena adventure with me you will know that Selena making a song with a guy equals a hookup, according to the media who will twist anything to get the latest ”scoop” on Gomez. Zelena never had any kind of relationship. Although they became good friends, they worked on a song together and that is all. Selena laughed off the rumours of being pregnant with Zedd’s child, and she still cannot believe the things that she reads about herself! Can you imagine finding out from the internet that you’re pregnant? Most people find out from a pregnancy test, but not Selena! Zedd is a very genuine and sweet person and has worked with many talented singers, but he wanted to borrow her voice, not her body. Although they do look cute together, it never happened and it seems like it never will. Orlando Bloom and Selena Gomez were probably very confused about what they had to read about themselves and their own dating life, as none of it was true. Apparently, at Bloom’s birthday party the two hooked up, and Selena was reportedly using him to make Justin Bieber jealous after their breakup. How do the media involve Justin in every SelGo rumour?! A source said that the two were very, very flirty, but they did not hook up. They have been spotted together many times and, as you can see in the photo, Selena was not impressed with the paparazzi taking photos and creating gossip from those photos. Also, according to rumours, Orlando was dating Selena and Katy Perry at the same time! Of course, this is also untrue. Just as Selena is accused of dating every guy she so much as looks at, Orlando’s life isn’t exactly much different from that. He has been accused of dating many, many women that he has been spotted hanging out with. Selena and Orlando are just friends, and it must get seriously annoying being accused of hooking up with every guy she’s friends with! We feel for you, Selena, but this proves that we should never listen to gossip. Whatever you hear about queen Sel, believe the opposite! I'm a 17-year-old girl with a passion for writing. Who is Swedish star Zara Larsson? Normal human relationships: Are they really gone? Have Cheryl and Liam Moved In? How conscious are your conversations? Arianators, Selenators, Lovatics: Who has the best fan army? Have you heard the story of Kaley Cuoco’s tattoo?